A student concept I have designed a while ago for a logo of Lithuanian capital Vilnius. "Legend has it that the Grand Duke of Lithuania, Gediminas, was hunting in the sacred forest near the Valley of Šventaragis. Tired after the successful day's hunt, the Grand Duke settled in nearby for the night. He fell soundly asleep and began to dream. A huge Iron Wolf was standing on top a hill and the sound of hundreds of other wolves inside it filled all of the surrounding fields and woods. Upon awakening, the Duke asked the pagan priest Lizdeika to interpret the meaning of the dream. 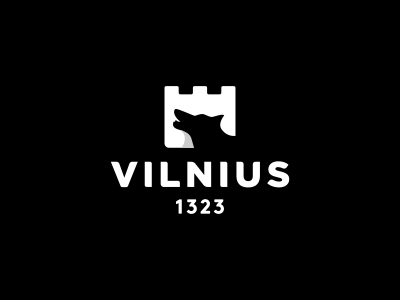 And the priest told him: "What is destined for the ruler and the State of Lithuania, is thus: the Iron Wolf represents a castle and a city which will be established by you on this site. This city will be the capital of the Lithuanian lands and the dwelling of their rulers, and the glory of their deeds shall echo throughout the world"